1. 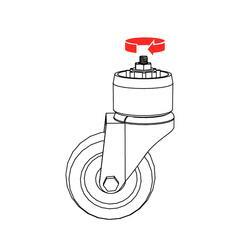 Insert the Caster Stem into the Caster Pipe Cap. Add a washer and a nut to the top to secure in place. 2. Tighten the nut on top of the Caster Pipe Cap assembly until secure. 3. 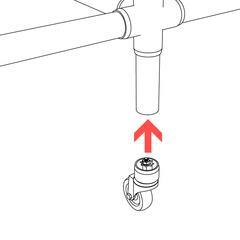 Insert the entire Caster Pipe Cap assembly over the end of a 1-1/4" PVC pipe. 4. 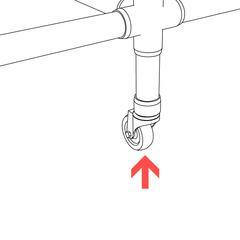 Press or tap into place until the Caster Pipe Cap iOS fully seated over the PVC pipe. PVC cement should not be required to secure the Caster Pipe Cap in place. 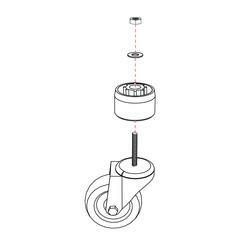 Be sure to perform the assembly of the Caster Fitting insert before pushing over the PVC pipe, as the fit is extremely tight.